CERN is the heart of particle physics research, where scientists are working to discover new phenomena using high-energy equipment. These research challenges have driven inventions, such as the World Wide Web and superconducting magnets used by the Large Hadron Collider. 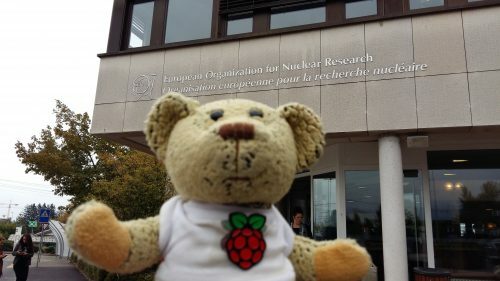 Theoretical calculations and experimental analyses are both heavily reliant on computer programming, so it’s a great place to host a Raspberry Pi programming event. This year, Brice Copy organised a Coding Pi Science event on the 7th and 8th of October. Working together with long-term Pi supporter Alan McCullagh, he invited three teams to prepare kits to build and program with attendees. To motivate the teams and the other attendees, there were a series of talks on Friday evening; these included a general introduction to the CERN Micro Club and the EU Code Week, as well as a motivational talk on why computer programming is so important for scientific research. Each team then gave an overview of their project, in preparation for the workshop the next day. 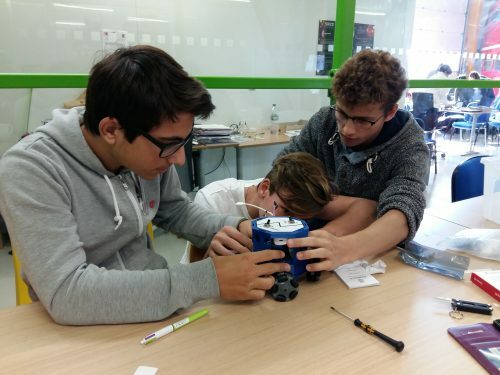 On Saturday morning, the teams, volunteers, children, parents, and teachers started to build a muon detector (Muon Hunter), a robotic arm (Poppy Ergo Jr.), or a programmable WiFi car (GianoPi). The idea was to build a kit together with the team leaders and other volunteers, and then take the kit home to program it. These three kits provide different challenges: the Muon Hunter kit requires some soldering and uses a C programming interface, the Poppy Ergo Jr. snaps together and is driven using Snap, and the GianoPi needs soldering and is controlled by Blockly. GianoPi was designed by Stefania Saladino. It consist of four servo motors, multi-directional wheels, an ultrasonic sensor, a Pi Zero, a servo control HAT from Adafruit, a WiFi adapter, a battery pack, and some electronics to allow the kit to be easily turned on or off. Brice Copy created the software to interface with the GianoPi using Raspbuggy, which is a Blocky application. Similar to the Poppy Ergo Jr., the GianoPi is controlled over a network connection, allowing the robot to be remotely accessed. We had great fun in Meyrin (just outside Geneva). It was brilliant to have a “bilingual event” in both English and French. A lot of folks made the trip from the other side of the French border to Switzerland (the site straddles the two countries). Strongly recommend the visit to the site if you get the chance. This is great in furthering what a R-Pi can do besides teaching students about computer technology but rather what one can do with that technology. 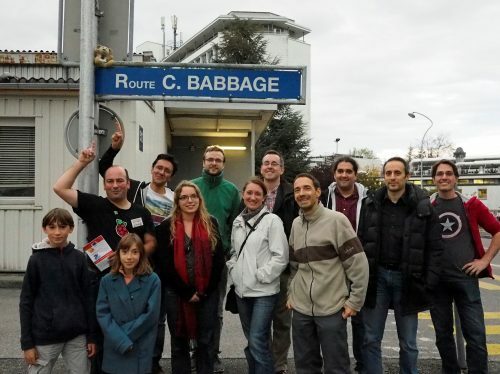 Pedantic nit-pick: They didn’t invent the Internet at CERN – that was done in America. What CERN invented was the World Wide Web. Great stuff. I like the possibilities of remote control via network, lots to think about.